Last night, Chase’s bed bit the dust. His was the nicest of the three toddler beds and the one I had the highest hopes for reselling when the time came. Instead, his was the first (and probably not the last) bed to break. His bed actually broke a couple of weeks ago too, but Nick rigged it back together with some wood glue and stronger bolts. Sadly, the bed could not withstand the brute force of three almost-4 year olds. And no, they weren’t jumping on it. They were moving it when the foot board broke off. So last night (I was out), Nick let the boys all put their mattresses on the floor together. When I peeked in on them before I went to bed, all three boys were curled up together on the middle mattress. Seriously, the cutest thing I’ve seen in a long time! Made me wish I had a night-vision setting on my camera so I could take a picture. Anyway, now that a bed is officially broken beyond repair we have a dilemma. Part of me feels like they aren’t old enough for bunk beds yet (I believe the age on those things is 6), but at the same time I don’t want them all sleeping on the floor for the next 2 years. I also am cheap and don’t really want to buy another toddler bed. Before we bought the toddler beds the plan had been to buy two twin beds and put a trundle under one of them, but that wouldn’t all fit in the room. Ultimately we want to get one of those sweet triple bunk beds that is shaped like an “L” – two beds are on top, one is on the bottom and then there’s a storage type area under the loft on one side. I believe it’s the only kind of bunk bed we’ll be able to get into that room. Unless we do the trundle kind, but that’s not as cool obviously. 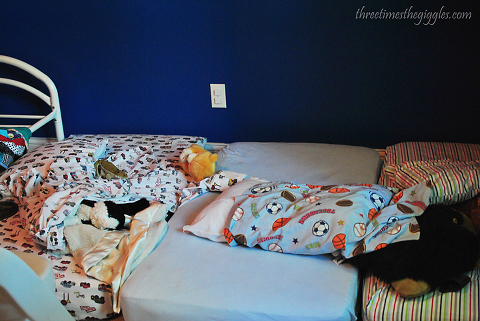 So parents – how old were your kiddos when you put them on the top bunk of a bunk bed? How did the transition go? How was it for middle of the night bathroom trips? We’re looking for a solution that doesn’t involve buying a bigger house (even though that’s what I really want to do). Man, that’s tough! I’m not sure what I’d do if one of the boys’ toddler beds breaks. But our plan (and thankfully we have just enough room) is to get bunkable twin beds when they outgrow the toddler beds, and bunk them when they’re older. Strangely I would have trusted my 3 year olds on bunk beds more than my 4 year olds! Anyway though, if you have any worries at all about them being on bunks at this age, you should wait. Much better safe than sorry. Oh, duh, I missed the “weren’t” in “jumping on the bed”. ha ha!